processed image showing the vegetation density (right). the water, left: suspended matter (clay, dust and other pollution). channels with aground resolution of 30 metres. 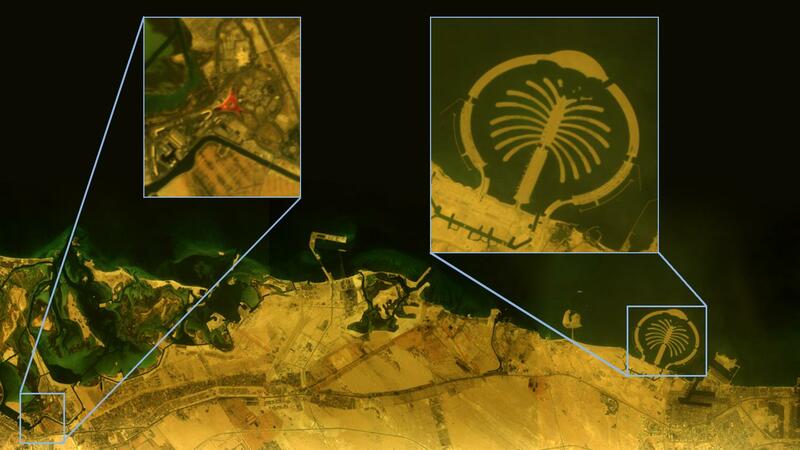 The German Aerospace Center (Deutsches Zentrum für Luft- und Raumfahrt; DLR), and Teledyne Brown Engineering presented the first images of the DESIS hyperspectral Earth observation instrument at the International Astronautical Congress (IAC). The instrument was mounted to the exterior of the International Space Station on 27 August 2018. 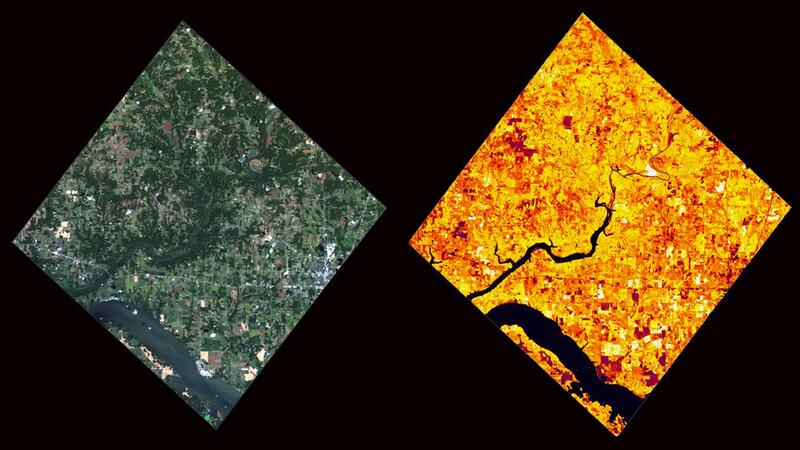 DESIS, the DLR Earth Sensing Imaging Spectrometer, has the highest performance of any hyperspectral Earth observation instrument in space. From its 400 kilometre-high orbit on the International Space Station ISS, this instrument acquires image data on 235 closely spaced spectral channels with a ground resolution of 30 metres. This data is making it possible for scientists to gain very precise details of changes to Earth's ecosystems. For example, they can use the information obtained to assess the health condition of forests or agricultural areas, and take such assessments as the basis for yield forecasts. They can also use this data to monitor environmental problems, thus providing the basis for devising measures to protect the environment and resources. Hansjörg Dittus, DLR Executive Board Member for Space Research and Technology, is enthusiastic: "I am happy to say that the installation of DESIS – and its commissioning – have proceeded smoothly. We have already received and analysed the first data – one month earlier than anticipated. The wealth of data provided by DESIS is a fresh source of knowledge for agriculture, biodiversity, geology, water-based ecosystems and desertification. It is thus a very important instrument for the environmental monitoring of Earth." The hyperspectral instrument is a joint project between DLR and the United States company TBE (Teledyne Brown Engineering), which owns the MUSES (Multiple User System for Earth Sensing) Earth observation platform on the ISS. In the course of this joint venture, DESIS will be providing DLR with data for scientific purposes, whilst TBE will be responsible for the commercial distribution of the hyperspectral data. David Krutz, project manager for the DESIS instrument – and therefore the person responsible for the construction of the instrument at DLR's Institute of Optical Sensor Systems in Berlin-Adlershof – was equally enthusiastic: "DESIS fulfils all expectations." For the initial commissioning, Krutz travelled to TBE's facility in Huntsville, where the MUSES control centre is based. This gave Krutz the opportunity to work with TBE's engineers to commission all of the subsystems immediately after installation. Krutz summed it up as follows: "DESIS has successfully passed all of its tests, and we were able to acquire the first image amazingly fast. Seeing the first results with our very own eyes was truly special." "We can derive a fascinating extent of information from the data." Rupert Müller, project manager for the ground-level segment within DLR's Earth Observation Center (EOC), had confidence in the system: "DESIS has crucially expanded our know-how in the field of Earth observation. Although there is still a lot to do before DESIS is operational, the first images are very promising. We can derive a fascinating extent of information from the data." The team of scientists and engineers has already been able to complete the first topic-centred analyses: it has been possible to arrive at an assessment of the concentration of chlorophyll a in the waters around the Falkland Islands from the corresponding image. 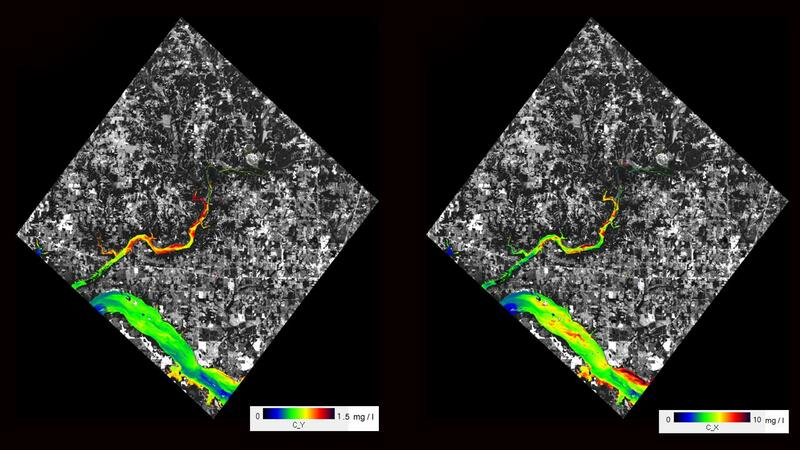 And researchers working near Huntsville have succeeded in quantifying the content of coloured dissolved organic matter in the Tennessee River in Alabama, USA. These substances consist of organic material, such as leaves and roots. Long organic molecule chains are produced in the process of exposure to weathering, and these chains can be well detected by DESIS on a range of spectral channels. By merging its data with other Earth observation data, especially in conjunction with some of the sensors that will be used on the MUSES platform in the future, it will be possible to further improve the quality of the data obtained by DESIS. The success of this commissioning procedure was summed up as follows by Uwe Knodt, the overall project leader: "DESIS is providing DLR with data from the most powerful hyperspectral instrument in space. We already have data requests from researchers and industry from all over the world. Among other things, in the area of smart farming, it will be possible to identify stressed plants and provide them with treatment before they deteriorate and shrivel up." DESIS is currently the only hyperspectral scanner in space with such a high level of resolution. The cooperation partner Teledyne Brown Engineering provided financial supported for the development of the spectrometer. As Knodt emphasises: "This joint venture has made DESIS a very efficient spaceflight project whose benefits will bear comparison with much more costly hyperspectral missions." The benefits of the joint venture have also been extolled by Jack Ickes, Senior Vice President of Teledyne Brown Engineering: "It's a magnificent partnership, and we are blessed with fantastic teams on both sides." Whilst DLR makes use of the data for its own research, TBE will market the data acquired with DESIS, distributing it in the form of images and for purposes of applications that will include smart farming.